We always loved our seafood in a fresh tomato sauce. Our dad was so proud of his garden. Every year he would plant his beefsteak and plum tomatoes fresh garlic, Italian parsley and basil. The sauce was always the best when fresh. He always used lots of garlic, fresh herbs from the garden and he prided himself on his prize tomato sauce ,every time he made a new batch it got better and better. This is a light sauce with red wine, and fresh plum tomatoes. Seafood lovers, this is a medley of fresh veggies and a fresh plum tomatoes with red burgundy wine sauce primavara style. The plum tomatoes go into a food processor but not too long, keep it chunky. The freshest sauce is always the best with fresh plum tomatoes. A medley here of shellfish include white shrimp, scallops, lobster meat and and crab. Red peppers, garlic cloves, whole mushrooms sliced thick and zucchini make this rich primavara sauce. Throughly washing the vegetables to make sure they are ready to prepare. Plum tomatoes are the best to use in this recipe. 2 1/2 cups of assorted cleaned shell fish or white fish suggestions, shrimp, scallops, calamari, crab, lobster, tilapia, or fish of your choice. In a large fry pan, saute vegetables and fresh garlic for 7 minutes in 1/4 cup of canola or olive oil, add seasonings. Puree tomatoes in a food processor keeping tomatoes chunky add to pan. Add wine and 1 cup of water. Simmer for around 25 minutes. Add fish at the end, cook heating fish throughly and if using shrimp till it turns pink. Boil in salted water 1 pound of Mostaccioli Rigati, cook as desired doness. Drain, toss in olive oil and parsley. Spoon on a large platter and pour primavara sauce on top.. Garnish with fresh basil. We all eat vitamins and store garlic are used in his great taste and flavor is also good natural antibiotics even swine flu. Is this ever gorgeous! May I have some please? I don't want to go outside. The wind is howling. I love the chunky sauce and the platter of all those wonderful foods - all on one plate! I always serve a surprise dish of my own choosing on Christmas Eve. I think this will be my surprise this year. Thanks so much for sharing it. I bet your Dad and mine would have had a grand old time boasting about their tomatoes over a jelly jar glass of homemade wine....I love your stories! And man, am I jealous of the seafood you are getting down there. @kathyvegas your right I bet they would have...I miss him dearly! And your dad was a very handsome man! I am sure he must have been popular :o) - what's better than seafood anyway? maybe chocolate? Those who love gardening revel in it. But natural. Good fish medley. Never tried mixing the fish. I would like someone to make this dish for me tonight for dinner. It looks so colorful! that looks delish, lots of great ingredients and flavors. I LOVE all this beautiful seafood! 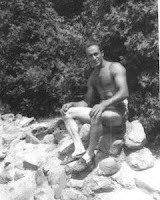 I also love that you post these great old pics - your dad looks like a movie star, for real! All that seafood looks just too yummy!